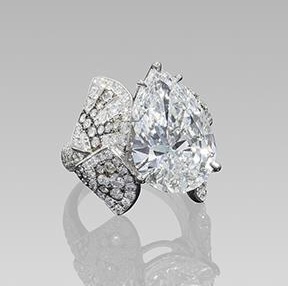 RAPAPORT... Luxeford published the results of the top lots sold during its fine jewels auction that was held on May 25 at the Conrad Hotel in Hong Kong. The auction house did not provide a sales total or the percentage of lots sold. Among the top lots was a pear-shape, 10.15-carat, D, IF type IIa diamond ring (pictured) that sold for $1.34 million (HKD 10.657 million). A V-shaped diamond rivière necklace, set with a string of baguette diamonds accentuated to the front by brilliant-cut diamonds, mounted in platinum, was sold for $133,115 (HKD 1.032 million). The third top lot was an 8.17-carat unheated spinel and diamond ring that sold for $128,471 (HKD 996,000), while a pair of emerald and diamond ear pendants, featuring approximately 17.55 carats of emeralds, accentuated by approximately 15.65-carat two-tiered pear-shaped diamond border and links, sold for $117,894 (HKD 914,000).